Was your church full on Christmas? Catholics are more likely to attend Mass on Christmas/Christmas Eve than any other day of the year (followed closely by Ash Wednesday and Easter) and there is evidence that this past Thursday/Friday may have had attendance rates higher than Christmases in recent years. 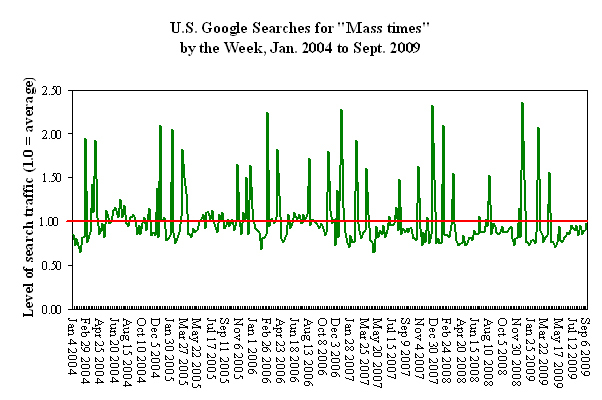 Google searches for “Mass times” were nearly three times higher (2.86x) last week than in the average week from 2004 to 2009 and these exceeded the search volumes of other recent Christmas weeks (for more information see: Searching for Mass online…). Mass at Christmas, more than any other time of year, provides a glimpse of what the Catholic Church might look like on a weekly basis if the decline in Mass attendance from the late-1950s peak had never occurred. 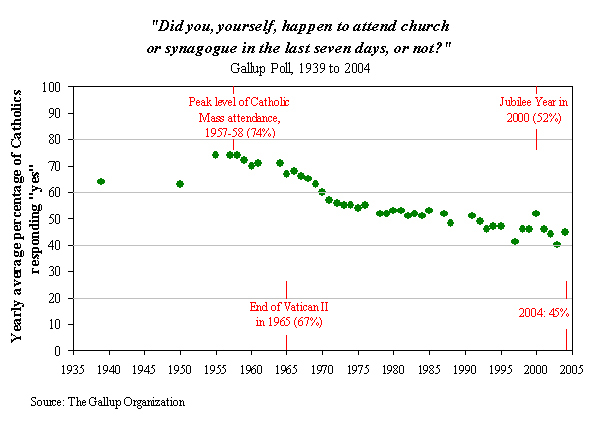 In 1957-58, Gallup surveys estimate that 74% of adult Catholics attended Church in an average week. 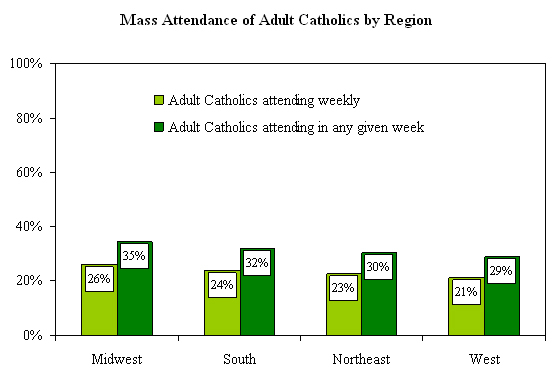 By comparison, today, CARA estimates that 31% of adult Catholics attend Mass in any given week (for more information see: The Nuances of Accurately Measuring Mass Attendance). However, CARA surveys also indicate that 68% of adult Catholics attend Mass at least “a few times a year”—most likely representing Christmas, Ash Wednesday, and/or Easter. Given recent changes in numbers of parishes and normal variations in the number of Masses offered, the current weekend seating capacity of the Catholic Church in the United States (the aggregated number of seats x number of Masses per parish) is difficult to know. However, this can be estimated using data from CARA’s National Parish Inventory (NPI) a database of parish life in the United States. The NPI includes information about the seating capacity and number of Masses in more than 7 in 10 U.S. parishes (seating capacity for 71% of parishes and number of Masses for 78% of parishes). To make the estimates described below we have imputed missing data at the parish-level with regional averages (Census-9) for seats and number of Masses. Further, we have adjusted the overall total capacity down to account for the number of parish closings and mergers that have occurred in recent years (a reduction of 5.9%) since much of the NPI data were collected. Using these methods we estimate that the building seating capacity of Catholic parishes in the United States include spots for about 8.8 million people and there are about 63,800 Saturday Vigil and Sunday Masses in an average week (… in October, a period outside of the summer vacation season and within Ordinary Time for the Church). 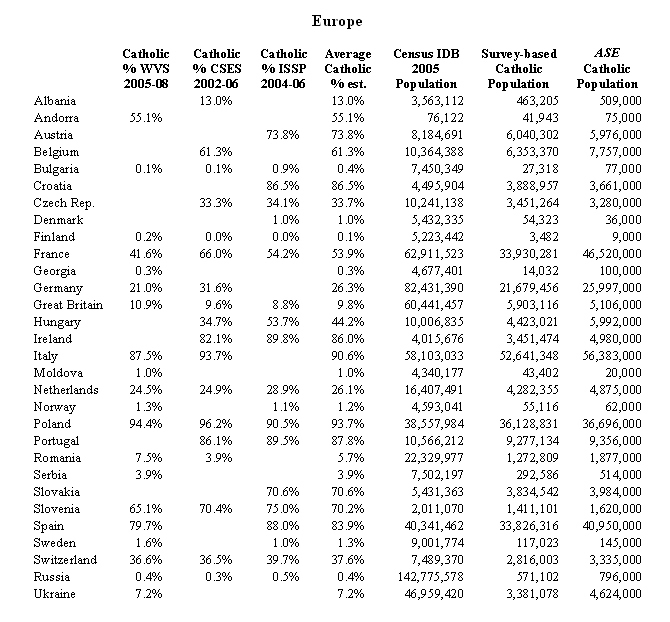 Using the NPI data, we can thus estimate that the total weekend seating capacity for the Catholic Church is currently about 33.4 million. In other words, on an average weekend, 66.3% of seats are filled (by an estimated 22.1 million attendees). On such a weekend the average number of Saturday Vigil and Sunday Masses per parish is 3.6 with an average church seating capacity of 492. If 68% of Catholics attend Mass in a given weekend, such as at Christmas, more often than not parishes must increase the number of Masses scheduled to deal with the estimated 47.9 million attendees nationally. On an average weekend, there is one Mass for every 347 Mass attending Catholics. To maintain this same ratio at the higher attendance level of 68%, the number of weekend Masses offered needs to more than double to about 138,000. Currently the Catholic Church, on most weekends, is more than able to meet Mass attendance demands. However, this excess capacity in Ordinary Time may only be momentary. The long decline in Mass attendance rates have halted and CARA has not identified any further declines since we began polling adult Catholics nationally in 2000 (for more information see: The Nuances of Accurately Measuring Mass Attendance). As the Catholic population grows—even at a Mass attendance rate of 31%—the physical capacity of the Catholic Church (e.g., number of parishes, seats, and Masses) will also need to grow. This will undoubtedly buck the recent trends towards parish closures and mergers and create even more pressure on priests in the United States who are also declining in number. After all there are only so many priests and so many hours in a day and thus there are real limits to simply increasing the number of Masses offered (and meet parishioner preferences for attending Mass at specific times). Imagine this scenario 25 years in the future: A) the Catholic population grows 25% (as it has since 1985—also note that this implies relative stability with Catholics continuing to be about 23% or 24% of the total U.S. population), B) Mass attendance rates remain at the plateau of 31% (as they have for nearly a decade), C) that the typical number of Masses and number of seats per parish remains unchanged, and D) that the number of parishes declines at a 6.2% per decade rate (as it did from 2000 to 2009). A second and unrelated source is consistent with the state-level Mass attendance estimates made in "Midwest Mass Attenders Outpace Rest of the Nation." As it was noted in "Searching for Mass Online" one can use Google Trends to view how frequently Google users are searching for particular terms. 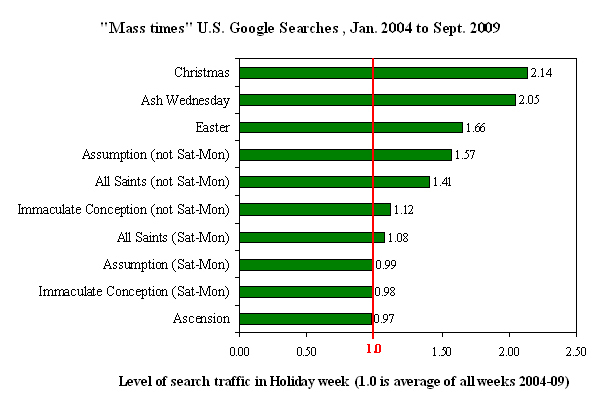 This post had noted the trends in searches for "Mass times" closely mirror what one would expect from the Church calendar. 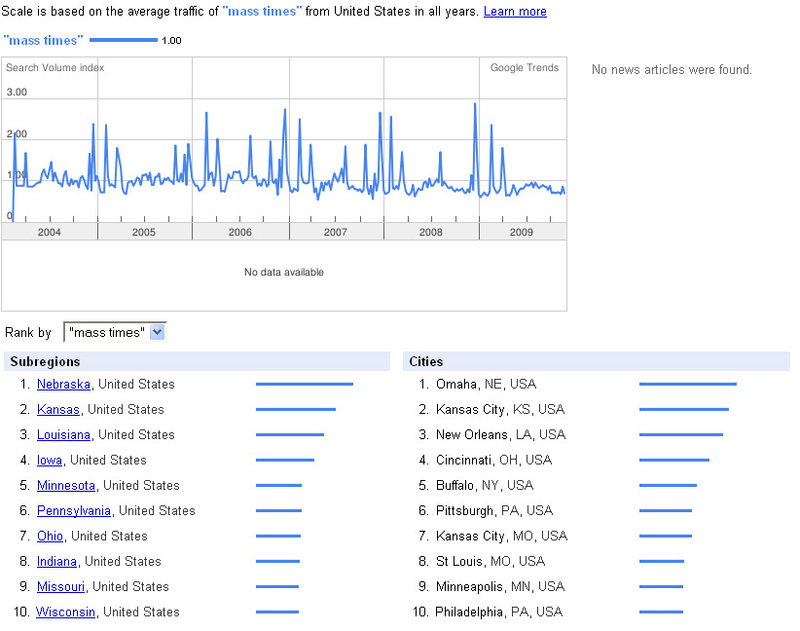 Searches for "Mass times" are more likely to come from people in Kansas and Nebraska than people in any other U.S. state. At the city-level Omaha and Kansas City, KS rank first and second. The top ten states are all ranked above average in CARA's estimates of Mass attendance. 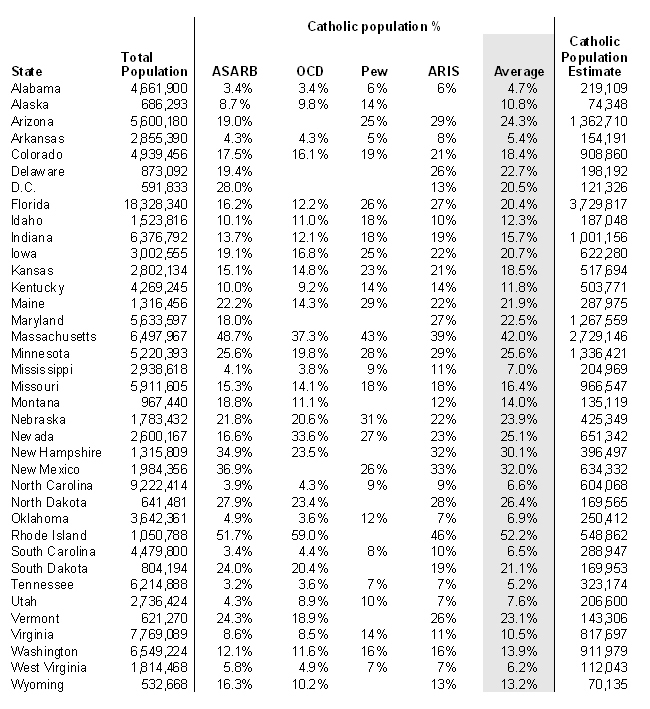 In which states are Catholics most likely to attend Mass weekly? 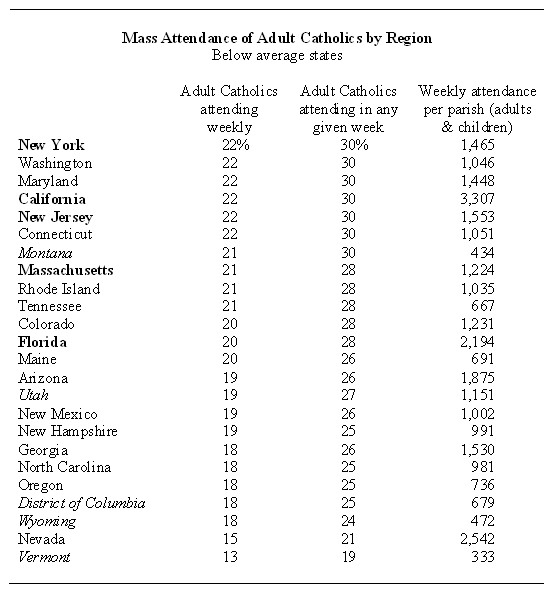 How many Catholics attend Mass in any given week in your state? These questions are rarely easy to answer. Although dioceses do October head counts these are generally not made public nor are they necessarily reflective of Mass attendance in general. Surveys rarely can provide an answer because these are typically limited to national estimates and there are too few respondents in any given state or region to make an accurate estimate. Just recently it became possible to estimate answers to these questions with the public release of the data for the Pew Forum on Religion & Public Life’s U.S. Religious Landscape Survey (conducted in 2007). This survey includes interviews with more than 8,000 Catholics (a national survey with 1,000 respondents typically includes interviews with only about 230 Catholics. 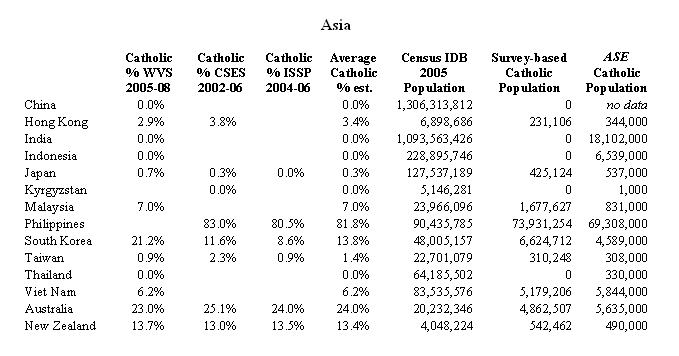 CARA Catholic Polls (CCP) typically include 1,000 Catholics). 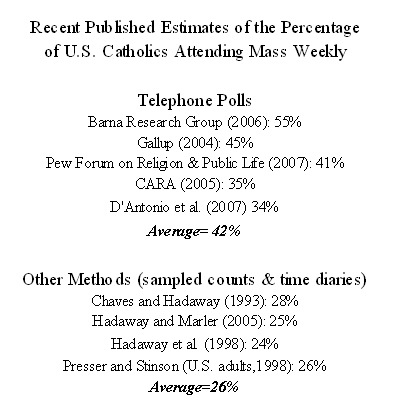 The major limitation of using the Pew study to look at Mass attendance is that it was conducted by telephone where people are more likely to “overreport” how often they go to church (i.e. say they go more frequently than they actually do) to an interviewer. 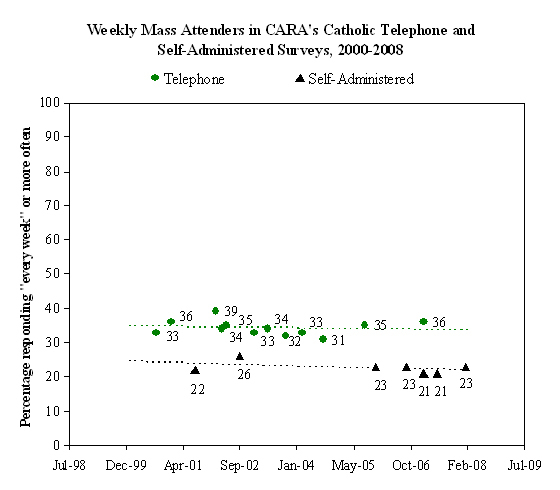 Comparing results of telephone polls and self-administered Knowledge Networks' surveys, CARA has found that Catholics are more honest in reporting their Mass attendance (as well as frequency of going to confession and financial giving) when no human interviewer is involved (for more see: “The Nuances of Accurately Measuring Mass Attendance”). 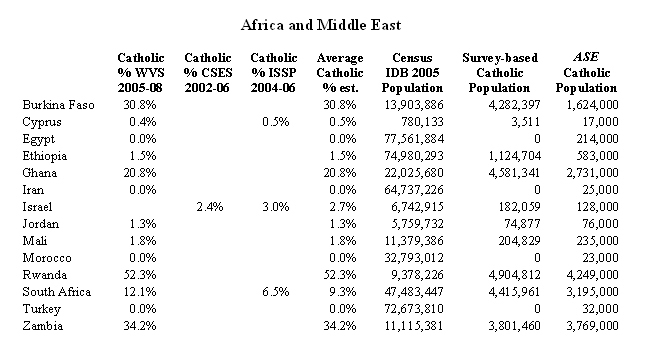 The analysis below utilizes Pew’s data and CARA’s results for a national survey of Catholics in 2008 where telephone methods were not used (Knowledge Networks' panel and survey methods were used instead). The analysis below uses the Pew estimates that have been adjusted using the CARA estimates to control for the overreporting of Mass attendance in the Pew survey. 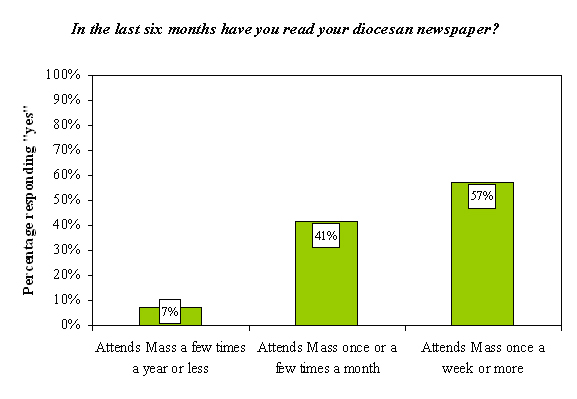 The Pew survey estimates that 41.4% of Catholics attend Mass weekly. This estimate is generally considered too high in comparison to Mass attendance headcounts, academic time diary research, and CARA’s series of Knowledge Networks' polls (where no interviewer is needed). By comparison, CARA Catholic Polls (CCP) conducted with Knowledge Networks estimate that 23.3% of Catholics attend Mass weekly (an estimate consistent with headcounts and academic time diary research). Thus, CARA’s Mass attendance estimate is 56% the size of Pew’s. If we assume that the level of overreporting by respondents in the Pew survey is consistent across regions and states we can adjust for it by statistically weighting these estimates down using the CARA Mass attendance estimates. 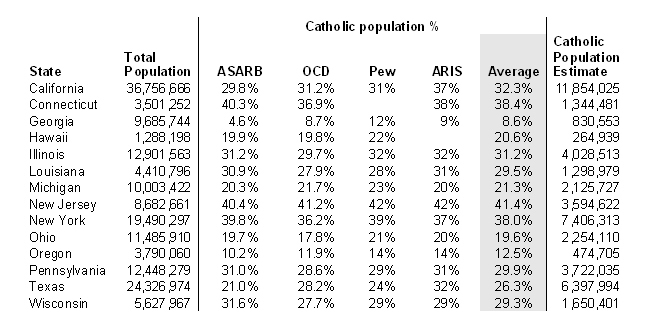 The tables and figure below include our best estimates for the percentage of Catholics attending weekly (i.e., going at least once a week, every week) and the percentage of Catholics attending Mass in any given week (excluding Ash Wednesday, Christmas, Easter, etc. where attendance is known to be significantly higher) using these data. 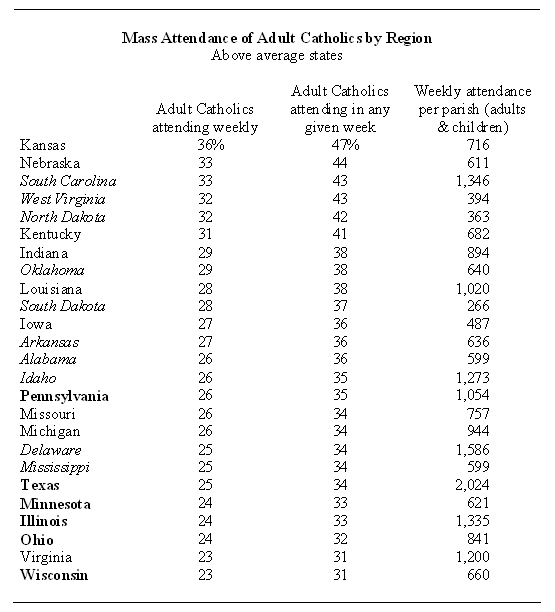 Mass attendance is estimated to be highest in Midwestern states where 26% of adult Catholics attend Mass every week and 35% of adult Catholics are at Mass in any given week (as some infrequent attenders are at Mass in any given week; for more see: “The Nuances of Accurately Measuring Mass Attendance”). Mass attendance is estimated to be lowest in the West (21% weekly and 29% in any given week). In the tables below each state is either listed in normal font, italicized or bold. States in bold have a sufficient number of interviews in the U.S. Religious Landscape Survey to where the state level estimate can be considered reliable. Whereas those in italics are based on too few interviews and may not be representative. All other states in normal font are somewhere in between these two levels of precision. Using CARA’s state Catholic population estimates (see: Measuring Up: Aggregating data to estimate the number of Catholics at the state level) and the number of parishes in the state in 2007 (when the survey was conducted) we also provide an estimate of the number of Catholics (adults and children) attending per parish in any given week. Although imperfect and subject to large margins of error these estimates are the best available. 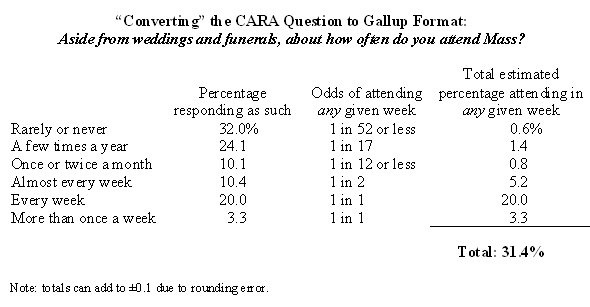 A comparison of these to actual headcounts would provide a better estimate (it is also likely that the Pew adjusted data still overestimate Mass attendance as well as not all social desirability pressure is removed in CARA’s self-administered surveys—some are still likely to overreport their Mass attendance using any possible survey method). Among the states with the most reliable estimates Pennsylvania has weekly Mass attendance estimates that are above the national average. At the other extreme, Florida Catholics have weekly Mass attendance estimates that are below the national average. Even though California and Nevada have below average Mass attendance percentages each of these states has a large number of attenders per parish because of the relatively small number of parishes in those states compared to the number of Catholics residing there. With the recent approval of the Bishop’s Pastoral Letter on Marriage, “Marriage: Life and Love in the Divine Plan,” attention is again being shifted to the current state of affairs in Catholic marriage. The document calls for, among other things, marriage ministry that “accompanies and assists people at all stages of their journey: from the early years when young people begin to learn about committed relationships to the later years of married life, and even beyond them to grieving the loss of a spouse.” But, what is the current young adult Catholic’s knowledge and attitude about marriage? Using this poll, differences of attitudes and behaviors about marriage can be seen by respondents’ generation. Interestingly, even though these generations are still coming of age, there significant differences between the Post-Vatican II Generation (born between 1961 and 1981, and more commonly called ‘Generation X’) and the Millennial Generation (born after 1981). Interestingly, Millennials are more likely to say that marriage is “whatever two people want it to be” – 69% of Millennials “somewhat” or “strongly” agree, while 53% of Post Vatican-II “somewhat” or “strongly” agree. 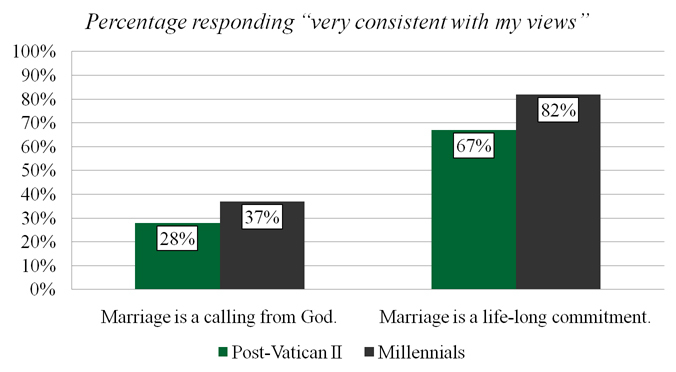 These data suggest that Millennials understand marriage differently than the Post-Vatican II Generation. 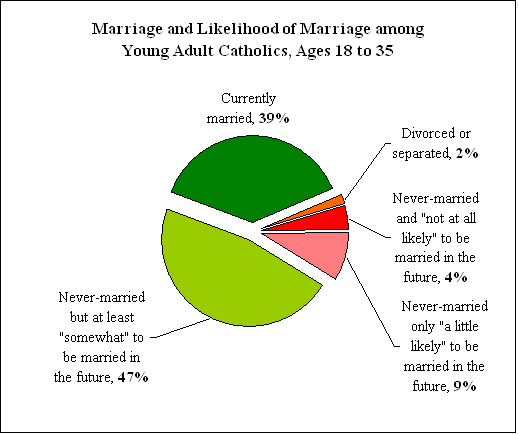 The Post-Vatican II Generation and Millennial Generation even report looking for different attributes in a spouse. 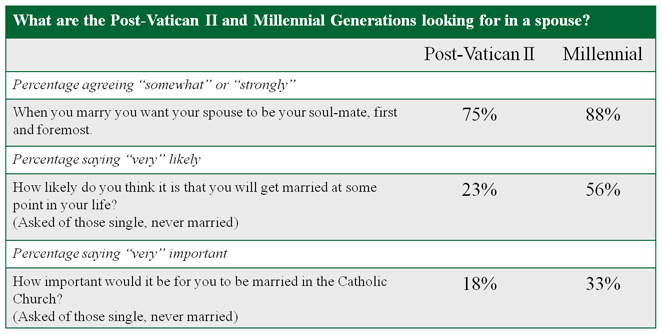 Millennials are more likely than Post-Vatican II respondents to want a spouse as a soul-mate, to report being “very likely” to get married at some point, and to want to be married in the Catholic Church. But – Millennials and Post-Vatican II are about as likely to say that it is “somewhat” or “very” important that their spouse be Catholic. While 30% of single, never married Post-Vatican II respondents say it is “somewhat” or “very” important for their spouse to be Catholic, 31% of Millennials responded the same way. But, what about divorce? In their pastoral letter, the Bishops of the United States are particularly concerned about the divorce rate, saying, “…the incidence of divorce remains high. 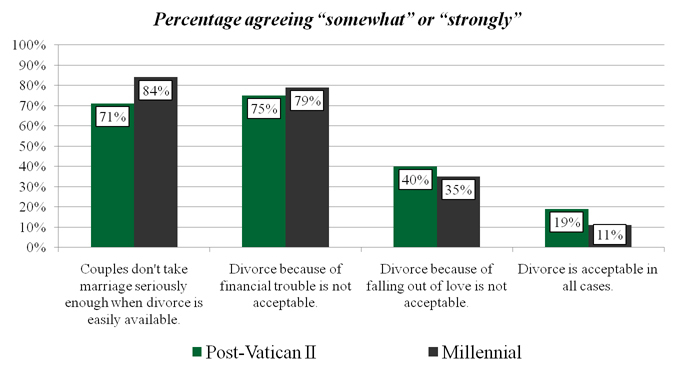 The social sanctions and legal barriers to ending one‘s marriage have all but disappeared, and the negative effects of divorce on children, families, and the community have become more apparent in recent decades.” Millennial respondents are more likely than Post-Vatican II respondents to agree “somewhat” or “strongly” that couples don’t take marriage seriously enough when divorce is easily available. They are only slightly more likely to agree that divorce because of financial trouble and because of falling out of love is not acceptable. 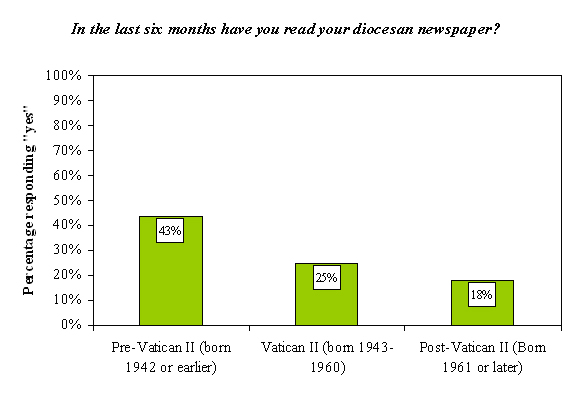 These differences may be a result of the spike in divorces during the Post-Vatican II Generation’s formative years. 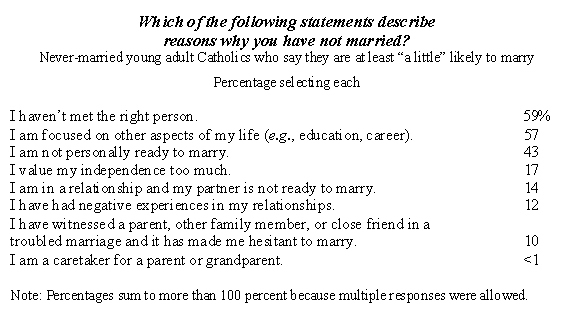 When currently single, never married respondents who say that they are unlikely to be married are asked why, almost one in five Post-Vatican II respondents (19%) say it is because they witnessed a parent, other family member, or close friend in a troubled marriage and it has made them hesitant to marry (compared to less than one in ten Millennials, 7%).